“It was, and remains, the best course to have ever graduated from the Tasmania Police Academy, thanks to the mischievous antics of Pete Andricopoulos, our course Grandfather Michael “Crusty” Bowden and the nurturing team spirit of Michelle Elmer, we all made it through unscathed and ready to take on the world!” she says with a laugh. After a childhood spent playing cops and robbers, and a desire to have an adventurous career doing lots of different things, joining the police was a natural fit for Tash. She also wanted to catch crooks. “The job has taken me from being a very naive 18 year old, not really knowing what I was getting myself into, to facing up and champing at the bit to Glenorchy night shifts. No one should ever have that much fun at work! I then worked alongside a team of investigators in the Solomon Islands, played with both Search and Rescue and the Cordon and Containment Team, was promoted to Sergeant and led a team of ‘young guns’ on the Hobart Watch (a big shout out to the ‘E’ Shift crew). Investigating our own was a very tough time but as always made easier by the people in the team. Inspector Freeman’s career highlights include working at Glenorchy Division. “I will always look back fondly on the seven years at Glenorchy Division. The team work between uniform and CIB was the best I’ve seen in any division. It was a challenging and busy station, but we all had each other’s backs and just got the job done … followed by some exceptional debriefing!” she says. “In 2007–08, I was very fortunate to be seconded to the RAMSI Mission in the Solomon Islands alongside Tony Peters, Shane Howard, Kevin Smith and Mat Drumm. The contribution of our peacekeeping efforts to the Solomon Islands cannot be understated and the community will always hold a special place in my heart. Tash says she’s at a very exciting point in her career. “As a relatively new Inspector I have many different avenues open to me. I want to consider ways of doing things differently, building teams and positively building the organisation and its people to be the best they can be,” she said. 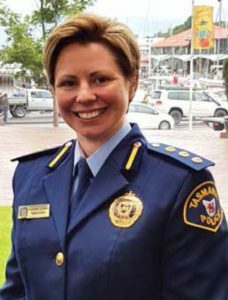 This page -- https://www.police.tas.gov.au/about-us/100-years-women-policing-tasmania-police/profiles/natasha-freeman/ -- was last published on December 19, 2017 by the Department of Police, Fire and Emergency Management.